The morning assembly was over. 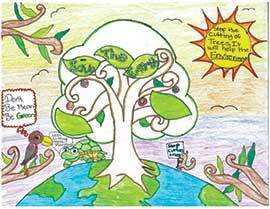 The topic which was read at the school assembly by Bhadra of class IV was about trees and their role in keeping the environment clean. Bhadra had read about the multiple benefits of trees and the children were convinced that trees are people’s best friends and that there was nothing more rewarding than growing trees. Headmistress Brinda teaches communicative English to children of class III. The children enjoyed and looked forward to her classes. She has a way with children and everyone feels included in the learning process. Her classes are lively and before one knows, the 40-minute period is over. Adriel and Mazin were discussing what they had done over the weekend when their teacher “madam” walked in. Adriel and Mazin were front benchers. Adriel was tall, plump and bespectacled. Mazin was lean and energetic with a mop of thick black hair. Everyone addressed Brinda as “Madam” as she was the head of the primary school. Madam carried a sheaf of papers to be distributed and everyone in class III got excited. Soon, she was handing out the papers to each student. There was a diagram of a tree on each paper. All around the tree were boxes in which the children were asked to write down what they had learnt about the usefulness of trees at assembly, that morning. There was complete silence as the children began to recall what they had heard at assembly. Everything was still fresh in their minds. After 10 minutes, the children started recounting the usefulness of trees. Madam called Ali to the blackboard. Ali was tall and could write with ease on the blackboard. He was new to the school. He had joined class III only at the beginning of the academic year. As he started writing on the blackboard what his classmates read from their papers, he needed help with the spellings! Madam encouraged the children to help him. Ali’s hand-written list on the blackboard was very illuminating. Trees give people oxygen for breathing and they take in the carbon dioxide humans do not need. Trees give us fruits and vegetables. They are the first source of food for all living creatures as they make food through the process of photosynthesis. 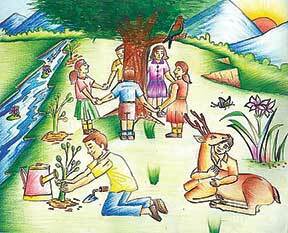 Where trees grow, there is water, an essential input for all living things. Where forests grow, there is bountiful rainfall. Look at the many creatures that live in and around trees: the six-legged winged insects, the two-winged colourful birds and bats, the varied arachnids and the four-legged civets and squirrels. The winged bat is a nocturnal visitor to feast upon the fruits of trees. The trees in the jungles are home to so many animals. Little wonder that Rudyard Kipling’s Mowgli loved the jungle and his animal friends in The Jungle Book. Niham, Vykha, and Gayathri excitedly told the class how thrilling it was to have watched The Jungle Book during the summer holidays. The movie became more meaningful because The Jungle Book easy reader had been their supplementary English course study in class II and Sakina teacher had vividly described each character in that story! The list on the board seemed endless. Madam Brinda initiated a discussion and soon everyone contributed ideas. The children loved going to school because teaching and learning there was fun and the teachers bonded with them well. Hansa and Athira of class III lived close to the school. They had just to cross the rail line and they would be home. On the western side of their houses was the beach from where they had a lovely view of the wide expanse of the Arabian Sea. Hansa and Athira were neighbours. They had grown up together and loved each other’s company. They had studied in Madam Brinda’s school since their kindergarten years. As they wound their way home one evening after school, they discussed the utility of trees. They were about to cross the wide maidan lined on four sides by trees when they saw a group of men with axes and ropes, looking at the trees and talking seriously to each other. “How long will we take to fell them?” asked the stout man. The girls were shocked! What they knew was that trees had to be cherished and not felled! How dare these men cut these gigantic, life-giving trees! Many of them were ripe with mangoes, jackfruit, and tamarind. The coconut palms had solid coconuts ready to be plucked. 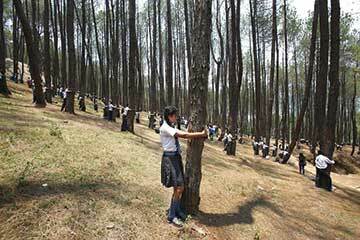 They just had to do something to save those trees. Hansa and Athira moved closer to where the men were standing. They were curious to know what their plans were. “It’s almost evening. Let’s not cut the trees today,” said the stout man. “Why not? Why not start cutting them today?” said the leanest man in that group. “Why can’t we start at 7 in the morning?” said another man. “Oh no! Not possible. I have a wedding to attend tomorrow and will be free only by 2 o’clock in the afternoon,” replied the stout man. So that was what these men had planned! Hansa and Athira decided that the trees had to be saved. But, how will they go about it? They decided to discuss this grave matter with their teachers and salvage those glorious trees. But it had to wait for the next day! “Let’s discuss this with Madam Brinda tomorrow,” said Athira. “Yes, let’s do that. 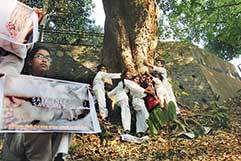 She will tell us a plan to help preserve those trees,” replied Hansa. “See you in the morning then, Hansa,”said Athira and the two girls bid each other goodbye. The first thing on their minds the next morning was to get help to save the trees. After the morning studies, they got ready for school, had a filling breakfast and wound their way to school. As they walked passed that line of trees, they felt cool with the breeze that was blowing around them. Squirrels played “hide-and-seek” in the branches of the tamarind trees. The crows and ravens pecked at the enormous, ripened jackfruit that was visible high on the trunk of a jackfruit tree. The mango trees were heavy with luscious fruit and the mynahs were feasting on them. “Yes, Madam. We need your help,” replied Hansa. “How can I help you, girls?” queried Madam Brinda. “Ma’am, on the way to our homes, there is a maidan with a wonderful grove of trees,” said Athira. “Yes, I’ve passed that way,” replied Madam Brinda. “Some men are planning to chop all the trees!” said Hansa. “Let’s stop those men, Madam! The trees must be saved! Do something!” the two girls spoke in unison and with passion. Madam Brinda agreed that they had to see those trees in the maidan growing graciously and magnificently for many more years to come. “Of course, girls! We will stop those men from hacking those trees,” replied Madam Brinda. “How, Madam?” quizzed the two friends. The local collector was an admired administrator. Ecological problems and issues were close to his heart. He was the right person to go to. Keeping aside all work in school and realizing that there was precious little time to be wasted, Madam Brinda wrote a quick petition to the collector about how those trees had to be saved and soon got it circulated among the students and teachers for them to sign it. “It must work, the petition must work! !” thought Madam Brinda as she hailed an autorickshaw and headed for the collector’s office, which was located just three kilometers away. Luckily, the collector, Mr. Prasanth was in the office. After 10 minutes of waiting, she was ushered into his office. “Yes, madam, what is it you want?” asked the collector. “Sir, I am the headmistress of a local, private primary school. Two of my students identified this problem which I have detailed in the petition. Can you help us?” asked Madam Brinda as she handed the petition to the collector. “Thank you very much Mr. Prasanth, both your timely help and intervention are appreciated,” replied Madam Brinda. “I will do anything I can to solve issues of administration and ecological problems. Is there anything else on your mind?” enquired the collector. “There is. I will appreciate it if you can visit our school and commend these two girls, Athira and Hansa,” said Madam Brinda. “With pleasure, madam! Let me see when I can fit in a visit to your school,” Mr. Prasanth said looking at his planner. “Thank you very much. You are the type of administrators we Indians need, administrators who know the pulse of the people and work with dedication!” beamed Madam Brinda and walked out of the collector’s office. It was a bright Monday morning. The sun was up in the eastern sky. The children were assembled in the courtyard awaiting the district collector’s visit to their school. Soon there halted a white car at the school gates and in walked Mr. Prasanth with a brisk gait. He smiled and waved at the students and soon the assembly began with the school prayer and pledge. Madam Brinda then addressed the students, “Children, I don’t need to introduce you to our district collector, Mr. Prasanth. We often see his photo in the newspapers. He is a dedicated and hard working young man. It is this district collector who read your petition and stopped those men from cutting those trees in the maidan near Athira’s and Hansa’s houses. Let us put our hands together and give him a loud clap to say ‘Thank you’”. The children clapped vigorously and Madam Brinda called the two girls to the front of the assembled students. “Here are Hansa and Athira of class III. The collector would like to say a few words to them,” she told the assembled students and teachers. Athira and Hansa broke into smiles as their schoolmates and teachers applauded them!